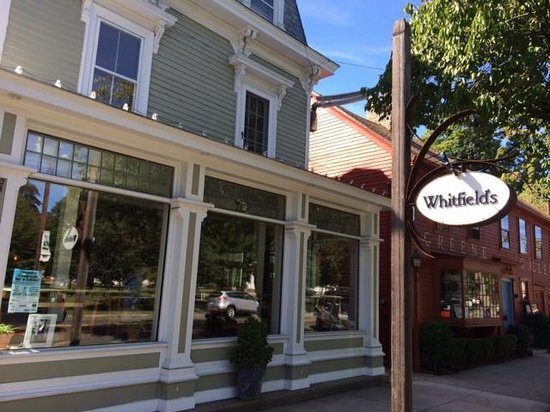 A Victorian building overlooking the Town green is the new home of Whitfield's, a Connecticut restaurant that has quickly become the place to see and be seen. Originally built as a residence, the building's façade was simplified to reflect its Victorian design and to increase the use of glass. We conceived the design to be bright and airy, creating the feeling of dining outdoors. From the outside looking in, the design invites the observer walking by, to join the fun inside. 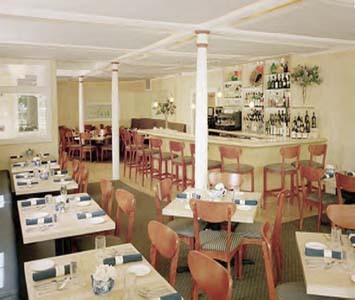 The main entrance to the space was moved from the front to the side, increasing the number of prime tables, and allowing patrons to view the whole space as they enter. From the entrance, patrons now see the bar straight ahead, the open kitchen to the left, and a full view of the Town green to the right. The design also created easy access to the space behind the building that was transformed into a formal garden with outdoor seating for 75 guests. This doubled the seating capacity of the restaurant. Whitfield's French Country fare is presented in interiors that are also European in feel, with white linen tablecloths and flea-market teapots filled with champagne colored roses. The details of the space include a park mural on the predominant wall, an open kitchen and frosted glass windows in the interior walls that provide glimpses of the action throughout the space.